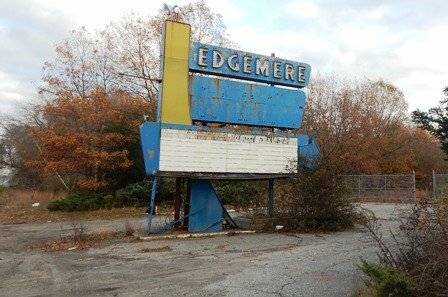 Shrewsbury – Recent speculation that the Market Basket redevelopment project of the Edgemere Drive-in, located on Route 20 in Shrewsbury, is going to happen sooner rather than later and without the public’s input, has some folks on “edge”. The Market Basket supermarket is the proposed anchor of a 120,000 square-foot mixed-use, retail and residential project to be located on Hartford Turnpike. Kristen D. Las, Shrewsbury’s assistant town manager and economic development coordinator, recently shared an update on the project. “We believe that there will be a restaurant and dry goods use and we also understand that there is a residential component of approximately 250 housing units with a majority of them being rental as well as a townhouse style component,” she said. It is unknown at this time whether the townhouses will be rental or owner-occupied. Mark L. Donahue, an attorney with Fletcher Tilton Attorneys at Law in Worcester spoke on behalf of Route 20 Nominee Trust, owners of the property, at a Board of Selectmen meeting last March, when this project was first announced. Then, at Town Meeting in May, he asked for support for two zoning change articles that would enable the project to move forward which were approved. Article 23 allowed for modification of the zoning map which unified the Zoning District so the entire lot was contained within the Commercial Business Zoning District and the Route 20 Overlay District. Article 24 made specific modifications to the Route 20 Overlay District to permit Special Permit and Site plan approval, granted by the Planning Board, creating a new permitted use referred to as a Mixed Use Development Horizontal. Donahue reported recently that the project is going forward and he anticipates construction to begin in 2018. The developers are working through traffic and sewer concerns at this time. The anticipated completion is slated for the fall of 2019. “The property has not yet been sold,” reported Las in an interview that took place Nov. 8. Las said that the town’s understanding is that at present the development team is doing their conceptual design work which includes off site traffic mitigation and sewer improvements. “We are having ongoing conversations with Market Basket and the developers and things are progressing… a lot of work goes on behind the scenes but we are looking at what the traffic impacts are going to be and the sewer and water impacts and do we have to change any of those designs,” Town Manager Kevin Mizikar recently shared. Once initial design work is complete the next step will be the developers will appear before the Planning Board for special permitting and site plan approval, and then the Conservation Commission, MassDOT for highway permitting and the sewer commissioners for sewer permits. Presently passers-by may notice that the property may have markers that the design team could use for identifying wetlands, soil testing or topographical and distance survey work, Las explained. From the time they submit their permits the process could then take up to a year overall. During this process is ample opportunity for the public to weigh in with their opinions/concerns at mandated public hearings. Las recommended that the community should stay tuned to Planning Board and Conservation Commission agendas for the latest information and public hearing meetings.